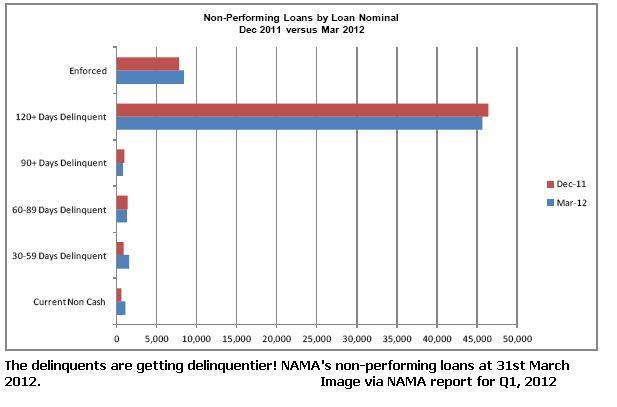 Okay, it’s from the NAMA quarterly report published just over a week ago, but it illustrates the fact that non-performing loans are growing at the Agency, and the increase in newly non-performing loans doesn’t augur well for the Agency where it is likely to have reached the milestone today where cash interest income paid by developers to NAMA, is not sufficient to cover cash interest that NAMA needs pay on its bonds and €200m-a-year operating costs. Or to put it another way, if 19% of €74bn of loans are performing at an annual interest rate of 3.5%, then that implies cash interest of €492m. NAMA has budgeted operating costs of €193m in 2012, and it is paying 1.5% – including hedging costs – on its €25bn of bonds which means its €492m interest income won’t cover its €568m outgoings. And the 19% performing loans includes restructured loans – the true non-performing loans % by reference to the original loans is probably 15%. Now this isn’t where you expected NAMA to be 2.5 years into its 10-year lifespan, is it? RTE is sometimes dismissively referred to as “Pravda” for propagandising Government policy, and playing down or ignoring Opposition views. That might be unfair but you really have to be impressed by the PR that accompanied this week’s publication of the state broadcaster’s annual report, and worse, the mainstream media re-mouthed the same partial view of RTE’s finances – “deficit of €16.8m in 2011”, “costs reduced by 20% since 2008”, “small surplus were it not for the ongoing impacts of the 2010 budget and the Broadcasting Act 2009”. Truth be told, RTE has run up a net deficit for the year of €69m, not €17m – most of the difference between the €16.8m widely reported, and the actual accounting loss comprises costs of funding RTE pensions. 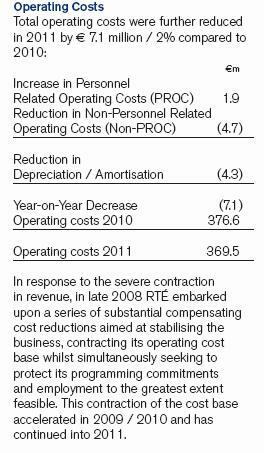 And RTE actually INCREASED payments to staff and contractors by €1.9m in 2011 despite all the blether about cutting costs. And this might be a good time to reproduce the graphic showing the cutest hoor in Irish broadcasting and two schmucks who must really need better agents! 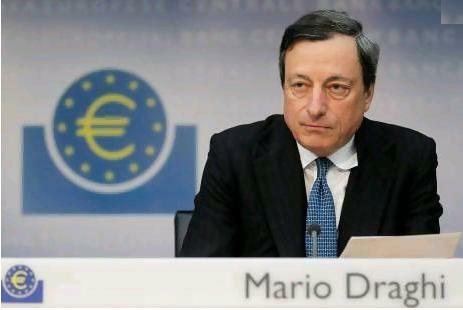 ECB president Mario Draghi, scotching speculation that the ECB was readying a “bazooka” of funding firepower for Spain and Italy. Such funding would be highly conditional it seems, and akin to the programme bailouts currently in operation in Greece, Ireland and Portugal. And it seems that Europe’s most powerful economy is still reluctant to loosen the purse strings anyway. The endgames in Europe will be one of three scenarios – a debt writedown with official funding paying more than assets are worth and the “loss” being absorbed by a group of nations, printing new money and allowing inflation to exceed 2%, or default. 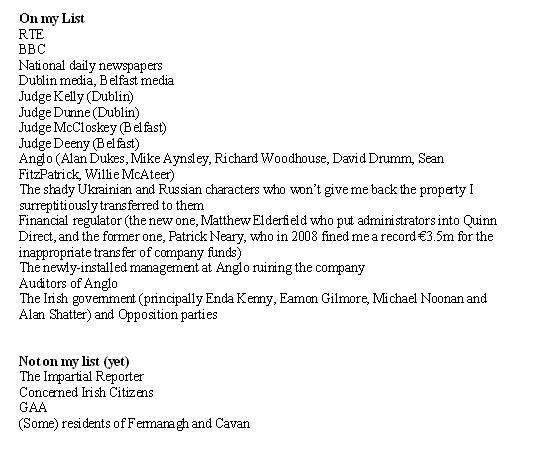 Poor old Kevin Bakhurst, the newly-appointed head of news and current affairs at RTE hasn’t gotten his feet under the table yet as he only starts work in September, but it seems some RTE insiders aren’t best-pleased to see the BBC’s controller of news “coming over here”. Apparently Kevin will be maintaining a base in the UK where he has school-going children and will be commuting between London and Dublin, spending the week in Dublin. And a “senior RTE figure” worries that Kevin might be on the 50-minute flight on a Friday evening when some spectacular news story breaks. And then what? for a maximum of 50 minutes RTE will be unable to process or present news? If that reflects the standard of management in the organisation, then maybe Kevin’s appointment hasn’t come a moment too soon. God knows RTE’s News and Current Affairs needs a shake-up. Maybe by the end of this year, we might actually get NCA programming with decent research and fact-checking and request for comment from adversely-portrayed characters, a coherent “story” that rises above the standard of community college media projects, not ruined by non-sequiturs, and programmes not drowned out in expensive and superfluous sound and graphics. The place might also benefit from better policies on intra-departmental shagging, so professionals didn’t have to think twice about offending partners-in-amour. Luckily, there is a base of decent NCA programming at RTE, but at present it is in the minority.